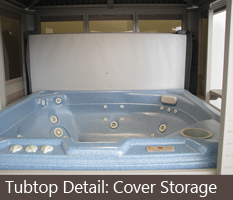 Tubtop Cover Storage – Hot tubs achieve much of their thermal efficiency from heavily insulated covers. Tubtops are designed to allow adequate space for these spa covers to operate and be stored when the spa is in use. Coverlift devices are now widely used with hot tubs. Lift devices add power assist and stability to cover operation. A neatly arranged, specially designed lift can be added to the interior of a Tubtop.